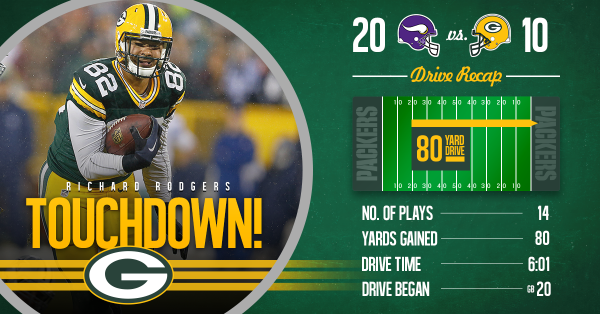 #Vikings ' lead cut to 20-10 after Aaron Rodgers finds Richard Rodgers for 16-yard touchdown. There's 13:27 left. The #Vikings lead is now 20-10 following the GB touchdown. Replay official must be blind? A pitch and run outside ? 2 carries for 15 yards for @JetMckinnon1 to start the drive. #Vikings punt and GB takes over at their 17 with 10:00 left. Passing attack, where the FffffuCcccck is it? #Vikings TE Rhett Ellison is out with a knee injury. Vikings are up 10 points with 10 minutes to go. If they hang on, they'll win the division, you'll recall. Packers with the ball. Game is going to get away! Sendajo...is killing me right now. Crosby is GOOD on 43-yard #FieldGoal . Crosby's FG puts the score at 20-13 with 5:35 left in the game. 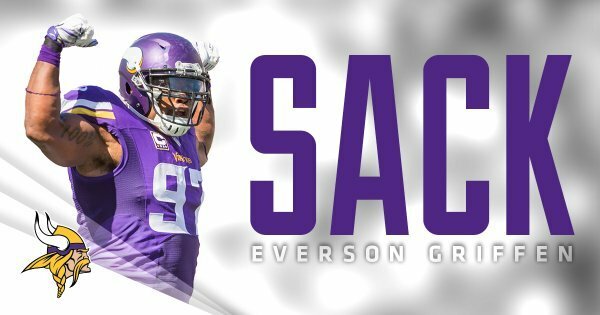 Speed rush from Everson Griffen gets to the QB. Big play on 3rd down, forces Packers field goal. Vikings fans in my mentions are panicked.
.@EversonGriffen now has 2.0 sacks tonight and 10.5 on the season. Maybe Ted the Glove can make his first above-average play of the night & wrap up this thing. Will the Vikes score here to put this game away, or hope just to hold on? Is that the most Corarrelle Patterson play of all time? You have to be kidding me. Wait, no you don't. Is that the most Cordarrelle Patterson play of all time? Zim is going to march that guy to the barbershop! GB takes over after the fumble at their 23-yard line.